I’m pretty sure you’ll agree that Brazil is filled with beautiful people. With their tanned skin and bodies that have been toned through years of soccer and samba, these are some of the most beautiful people in the world. One of the best examples I can think to give is Gisele Bündchen, supermodel extraordinaire. She was born in Rio Grande do Sul in 1980 and began professional modelling as a teenager. Since then, she has gone on to become the highest paid model of all time – and also one of the most beautiful! The Iguazu Falls (also known as the Iguaçu Falls) lie right on the border between Brazil and Argentina. They are truly spectacular, because unlike many other famous waterfalls around the world, this isn’t just one single waterfall. 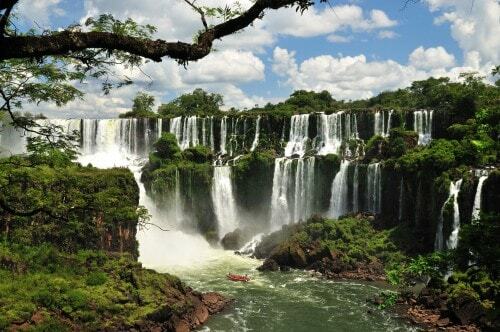 In fact, the Iguazu Falls are made up of 275 small waterfalls which make a breath-taking spectacle together. They sit across the Iguazu River. These waterfalls (which are taller and wider than Niagara Falls) have been declared as UNESCO World Heritage Sites, which is another impressive fact which can make Brazil incredibly proud! Created by Paul Landowski, the statue of Christ the Redeemer has become one of the most famous, iconic landmarks in the world – not just Brazil. At 30 meters tall, it towers over Rio de Janeiro and attracts thousands of visitors every year. The statue is famous enough in itself, but it does actually have another feature which just makes it all the more impressive. You’ve probably heard of the Seven Wonders of the World, which included the Pyramid of Giza and the Lighthouse at Alexandria. Well, an updated list has been created, which features seven more modern marvellous creations which exist around the world. Brazil’s Christ the Redeemer statue has made the modern list, which is proof that it really is something very remarkable! As we’ve already established, the Amazon rainforest provides a habitat for literally tens of thousands of different animal species. As a result, it should come as no surprize to learn that there are plenty of monkeys living in Brazil, because the dense forest vegetation makes the ideal environment. With such a large range of different animal species, it makes sense that there are more species of monkey in Brazil than anywhere else in the world. Deforestation poses a huge threat to them and their survival, so if you do visit the Amazon and you manage to spot one, count yourself very lucky! Brazil has an incredibly long coastline which stretches for almost 7,500 km along the Atlantic Ocean. Of course, this means that the country is edged with some beautiful beaches which have become destinations for tourists visiting from every corner of the globe. Few beaches are more popular than Praia do Cassino, which lies the furthest south out of all the country’s beaches. Aside from being very beautiful, there is one fact that makes this beach even more astounding. It actually stretches for around 230 km (that’s over 24,500 feet) long, meaning that it’s the largest stretch of uninterrupted beach in the world. Were you having trouble deciding where to go for your next vacation? Here’s your answer!